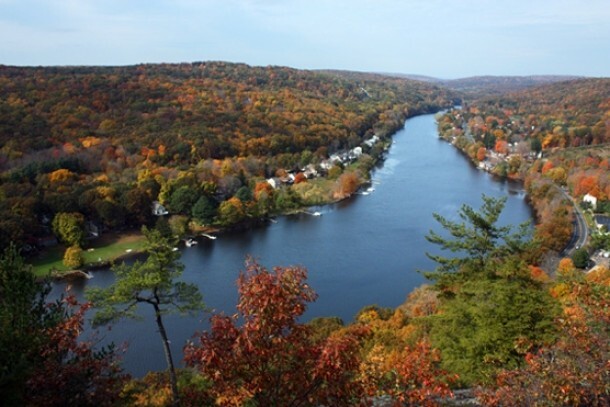 The town of Seymour, located in western New Haven County, lies in the Naugatuck Valley region of Connecticut at the confluence of the Naugatuck and Housatonic Rivers. First known as Chusetown, then Humphreysville, the town incorporated in 1850 and was renamed Seymour. Originally a farming settlement, then a small industrial town, in the nineteenth century Seymour produced pins, hoopskirts, and other manufactures. Later, Seymour became home to the H.P. & E. Day Company—a producer of hardened-rubber fountain pens. The Day Company eventually became the Bic Pen Company. Largely destroyed by the flood of 1955, Seymour has evolved from an active factory town to a quiet residential community. “Seymour Historical Society,” 2016. Link. O.H. Bailey & Company. “View of Seymour, Conn. 1879.” Bird’s-eye. Boston, MA: Bailey, 1879. University of Connecticut Libraries, Map and Geographic Information Center - MAGIC. Link. Conroy, Theresa. Seymour. Charleston, SC: Arcadia, 2010. Sharpe, W. C. Seymour and Vicinity, Historical Collections. Seymour, CT: Record Print, 1878. Link. Campbell, Hollis A., William C. Sharpe, and Frank G. Bassett. Seymour, Past and Present. Seymour, CT: W.C. Sharpe, 1902. Link. Seymour was Chusetown – Who Knew?